When you face tough design problems, turn to Whitney Blake, where 100 years of manufacturing experience meets innovation. Wire, cable and harness can be modified as individual components or as part of an assembly to deliver the performance you need. Design, supply chain, and manufacturing decisions can help you meet the cost, quality, and delivery parameters for your product. Standard products can be modified to give you custom performance within your budget and timeframe. Fresh Ideas & Practical Solutions: When you’re sure those specs will never be met, talk to Whitney Blake. Develop a lower cost version of an existing speaker mic cable for a customer who wanted to offer the market an economical alternative. 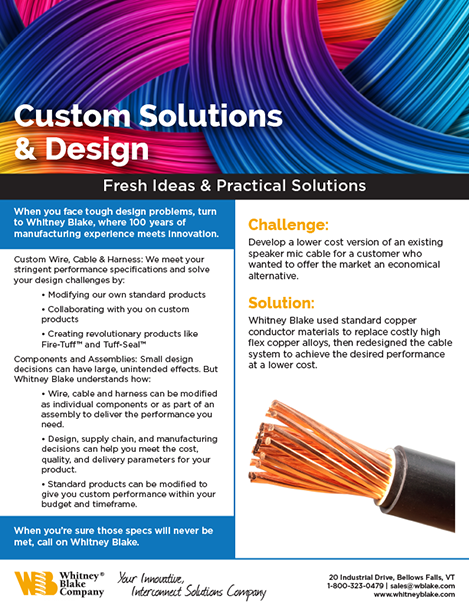 Whitney Blake used standard copper conductor materials to replace costly high flex copper alloys, then redesigned the cable system to achieve the desired performance at a lower cost.